We provide for all your concrete and asphalt needs. We do everything from demolition of any and all concrete or asphalt as well as excavation, land clearing, and preparation for new asphalt and concrete. We do placement and installation of all new asphalt and concrete as well. Over time, asphalt and concrete driveways and sidewalks start to crack and become a safety hazard. At this point, it’s time to demolish the surface and restore it. Removing an asphalt and concrete slab requires professional expertise and industrial-grade equipment. Our team is experienced in removing large areas of asphalt and concrete efficiently. At Rychart Excavation, Inc., we save home and business owners time and energy in breaking up asphalt and concrete slabs on your driveways, sideways, parking lots and other surfaces. We do excavation, demolition and hauling for new construction, and repair. Need Help with Asphalt And Concrete Placement And Installation? We know that the excavation phase of any project is absolutely crucial but not complete without high-quality asphalt and concrete placement and installation. So, if you want new asphalt and concrete to be placed and installed in your newly-prepared area, we can do that as well. We can work on foundations, slabs, footings, crawl spaces, basements, driveways, parking lots, detention structures and much more. Our skilled contractors at Rychart Excavation design and build RV pads for private and commercial use. We do everything to bring your RV pad, driveway or walkway from raw material to finished product. We also do repairs on all types of existing RV pads and driveways. Why Choose Rychart Excavation, Inc.? We have many years of experience in demolishing, excavation, hauling, placement and installation of asphalt and concrete from small to large-scale projects. We serve municipal, commercial, industrial, and residential customers in Hillsboro and the surrounding areas. 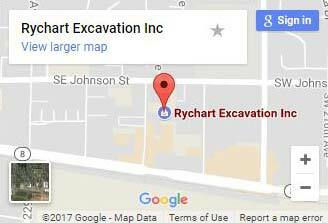 Rychart Excavation’s team of employees operate state-of-the-art equipment to complete your excavation and installation project on time and within budget. Insured and bonded, Rychart Excavation is ready to provide you with safe and risk-free excavation, demolition, and installation services.